The brief and perfunctorily courteous note from the Pope emeritus was just that, and there’s no reason to try and make the letter say what it does not say. A letter from Pope-emeritus Benedict XVI to Msgr. Dario Viganò of the Secretariat for Communications about a series of books on Pope Francis’ theological thinking has been the occasion of a good deal of talk over the past two days. Pundits and professional Catholics in the chattering class — regardless of how they view either the Pope or the Pope-emeritus — seem to want both too much and too little from the letter. One can understand why, but that’s no reason to try and make the letter say what it does not say. I applaud this initiative. 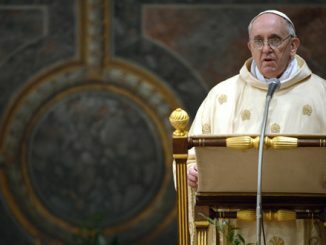 It contradicts the foolish prejudice of those who see Pope Francis as someone who lacks a particular theological and philosophical formation, while I would have been solely a theorist of theology with little understanding of the concrete lives of today’s Christian. The little volumes reasonably demonstrate that Pope Francis is a man with profound philosophical and theological formation and are helpful to see the interior continuity between the two pontificates, even with all the differences in style and temperament. It says the sort of things that anyone could say and mean them: Francis went to school, after all, and so did Benedict. If Francis is more well known for his pastoral touch, Benedict was hardly lacking in that regard (his talks with children, for example, are remarkable for their gentleness and easy sensitivity). Francis succeeded Benedict, and they both succeeded St. Peter. There’s no office on earth with more “interior continuity” than that of the Roman Pontiff. So, what happened? I don’t know for certain, of course, but here’s an educated guess based on what we know. Msgr. Viganò wrote to Benedict XVI on January 12, and Benedict responded in a letter dated February 7. We may surmise from the fact of the exchange and glean from the context of Benedict’s response that the Prefect asked the Pope-emeritus for some lines regarding the volumes in the collection. Viganò got a response, which he read in its entirety at a press conference launching the collection on March 12. That paragraph reads as though the Pope-emeritus is responding to a specific request: one for “a brief and dense theological page” about the books. It also puts the language of the quoted middle paragraphs in context. Through the lens of the final paragraph, omitted from the press release, the language of the middle paragraphs reads like an approximation — if not a rehearsal — of the request letter from Viganò. It’s the sort of thing one does in a letter, the purpose of which is politely to decline an invitation. 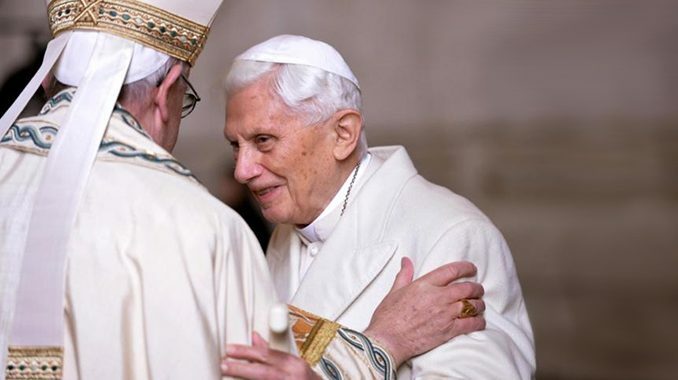 I do not think anyone can blame the Pope-emeritus for declining the Prefect’s invitation to endorse the series, any more than one might blame the Prefect for seeking an endorsement for the series from the Pope-emeritus. It can’t ever hurt to try, after all, and try Msgr. Viganò did. Usually, when one makes such a request, and receives such a response, one shrugs one’s shoulders and moves on. That’s not what happened this time, though, owing in large part no doubt to Benedict’s expansive if perfunctory courtesy, and Viganò’s evident desire to contribute something constructive to a conversation in the Church that has been too often far too acrimonious. It is almost certain that the Secretariat’s decision to release a doctored photograph obscuring the lines of Pope emeritus Benedict’s letter explaining that he had not read the books in the collection and therefore could not give them his endorsement, was one the Secretariat made quite earnestly and candidly. It is doubtless owing to his frank disposition and candid mind, that the Prefect of the Secretariat for Communications of the Holy See did not consider that his choice of excerpts could possibly lead people to believe he was using Benedict to prop up Francis. I like both men very much as well intentioned lovers of people. I admire neither man as being profoundedly theologically formed. The Scriptures have the sweet and the sour. They are formed in half…the first half. Near pacifism and near universalism rage like a wildfire or like a Kills concert amidst the new maigisterium…;). Their new death penalty abolition movement will get largely poor people killed in post Catholic countries like Brazil as one influence amongst others….in numbers that will make the inquisition look like a hood ambush. “Although he should kill me, I will trust in him”. It’s like Francis skipped 60% of the scriptures…and I read them all after having the Jesuits 8 years. I read them as an antidote. Nothing in this article about the death penalty, which you seem to be oddly fixated on. No matter how many times you claim that the Vatican is getting people killed because of its stance on the death penalty, it is not true. Sorry. So God did not give a death penalty for adultery partly in order to deter it? Ludicrous. Zen master archers take decades to achieve mushin no shin….mind without mind. You have reached it seemingly overnight. Sometimes it is necessary to amputate a limb to save a patient’s life. Amputations, then, are not inherently unjust or blameworthy — though, of course, they are blameworthy if they are not absolutely necessary. That said, no good physician will be sanguine about amputations: they are a last resort, to be discouraged as much as possible without endangering the patient’s life, and they will always feel like a failure, even if performed for the best of reasons. A good priest will have similar feelings about executions. The death penalty should never be applied where it is unmerited (which has often happened historically), but even when it is merited (in accordance with the cardinal virtue of justice), it should be avoided as much as possible (in accordance with the theological virtue of charity). The last resort idea does not occur in the Catholic Bible..or in God’s behaviour when He killed Uzzah, Onan, Dathan and Abiram…or when He gave stoning sentences to be done by the witnesses first. It as an idea might be one place in Aquinas 1300 years later. If you think him infallible, he also said to execute heretics…which is rejected now. Google the papal executioner of the 19th century, Giovanni Bugatti, a man who executed 516 men many of whom we can presume could have been housed for life sentences in the then large Papal States. That’s ten a year in a small area versus the usa…23 a year for 15,700 murders a year. As you can see, the usa executes very few compared to its numbers of murders…we are ludicrously permissive because the victim wasn’t us. We are gamblers. Japan is 14 times safer than us from murder but she is also an argument for non diversity as are several Euro countries. The recent Popes have lulled you to sleep on future victim deterrence ( the charity of saving lives of future victims)….about which they never refer at all except in the bizarre sense of deterring the one murderer you caught…see ccc 2267. Brazil, the largest Catholic population,with no death penalty and millions of poor has 50,000 murders a year and 10600 over that recently. China with millions of poor and a death penalty done quickly ( not like the usa)..has 11,000 murders a year…with 7 times the population of Brazil. If Brazil had China’s murder rate, they would save 49,000 usually poor human beings yearly. Countries with widespread mild affluence have low murder rates with or without the death penalty….Japan with…Austria without. But Japan would have low numbers regardless. But where there are millions of poor, the UN data tell the story. A serious pro dath penalty Pope (as Pius XII was) with gravitas on this issue could harangue murder central ( UN data)…northern latin America from Brazil to Mexico…no death penalty for civilian murder and the highest murder rates in the world by region. And he would save at minimum 50,000 lives a year if he could make them move simply toward China’s rate of .74 per 100,000 a year instead of the probably 26 per 100,000 average which is also the Brazil average. Bill — Oh, so now you’re going to use the “If it ain’t in the Bible, I don’t need to believe it” approach? Whatever. A snake-handling church might be more your speed. After all, they handle snakes because of Mark 16:18. On the other hand, Catholics have long understood that we have an obligation to go above and beyond the demands of mere justice. If you need to see it in the Bible, look at Matthew 5:38-48. Now maybe you can read that and still think that it may truly be said to a guilty man, “What you have done deserves death, yet I have the authority to decide whether to give you what you deserve, or some lesser punishment that will still keep the public safe. I love you, just like Christ loves you, but I am going to put you to death anyway.” It would be hard to say that such “love” has any meaning whatsoever; it could in fact be argued that any comparison of this with the love of God is blasphemous. as God is, man may be” is an old teaching of the Mormons, not of the Catholic Church. So do you use this technique of ad hominem slurs whenever the data is frightening vis a vis your vision of reality? If so, those around you in real life might pull back a bit. Good luck. FWIW. From what I’ve read the Old Testament death penalties for various infractions were more prescriptive in nature. The death penalty was used to show the seriousness of the offense. I’ve read that it was very difficult to carry out the death penalty in practice. Wikipedia has an article titled “Capital and corporal punishment in Judaism” that covers this. When the self convinced seek to engineer reality to fit a narrative they succumb to illegitimate means as if entitled. In this instance the baneful narrative is happily in trouble and Benedict’s blessing intended to stem the bleeding. Why the surprise when found out Secretariat Viganò openly admitted it? Those who manipulate truth, that practice corresponds to doctrine believe they own it. The danger of having two living popes — one is asked to help market something about the other. Benedict is no longer a Pope. He deserves respect for his character and learning, but no longer the respect that went with the office he once held. Do the marketers know that? You should have seen Father James Martin’s twitter account yesterday. He posted several times in jubilation that supposedly Pope Benedict had endorsed everything Pope Francis has ever done. He was doing the equivalent of Twitter hand flips. But, as we have seen, the letter is a very weak note basically saying I am too old and busy to read this stuff, so I really cannot comment. Add in a little perfunctory niceness, noting that Pope Francis is not a complete theological fool and Benedict is not a complete bookworm who shrinks at the sight of a human being, and you have the biggest nothingburger in the history of the Vatican. It shows you now desperate these guys in the Vatican are for some sort of endorsement, that they had to try to trick a 90 year old man into saying something nice about them, which they then altered. Can’t wait until the next Pope is here. This is the age indeed when we can’t expect the truth the Vatican. “Francis succeeded Benedict, and they both succeeded St. Peter. There’s no office on earth with more ‘interior continuity’ than that of the Roman Pontiff.” Perhaps, but ONLY due to the constraints laid upon the office-holders by the Holy Spirit. It is important not to overestimate those constraints, too. Popes are not sinless, and although many Popes are Saints, merely being a successor of St. Peter is no guarantee of eventually reaching Heaven. Furthermore, the Holy Spirit only guarantees protection against false teachings on Faith and Morals that are both explicit and formal — not against neglect, not against ambiguity, and not against actions. When we take those into account, and when we remember that formal, explicit teaching constitutes a very small (however important) part of the life of any Pope, it is clear that the “interior continuity” can be very interior indeed.